My wiring design has got a few extra options. 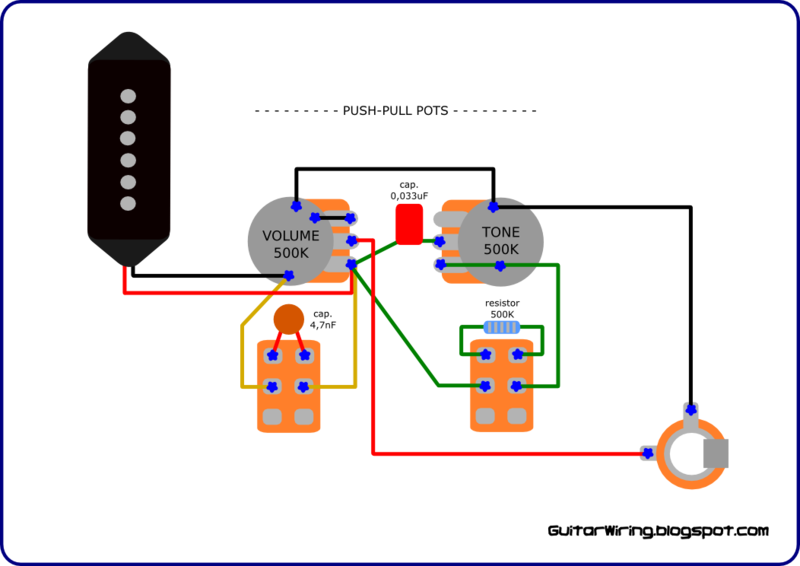 It can work like a typical "volume + tone" circuit, or with some special tone shaping tools. Extra parts: two 500K push-pull potentiometers, 0,033uF film capacitor, 4,7nf ceramic cap, 500K resistor. You will need also some additional wires. If you will not use the push-pull switches, the wiring will be working almost like a typical, original Jr wiring. There is the 0,033uF tone cap. It can cut off more treble than a standard one (0,022uF). It can also make your sound a little bit dull - if you will turn the pot all the way down. With some smaller ingerention, it will make a soft, warm tone. Stay with the 0,022uF cap if you like it. The special function of the switch in the volume potentiometer will make your guitar's tone much darker. It sounds very good with some tube amp crunch or overdrive. This function is basically a low pass filter. It cutting off some portions of treble. It's much different than a common tone control. If you will use the extra function of the tone push-pull pot, you will get a smoother tone. It's because of the 500K resistor. It will be connected in the parallel circuit with the volume pot. The wiring will be working for the signal like with a 250K vol. pot. It means a little bit less treble/high-end. As you can see, both function of push-pull switches can make a guitar tone warmer or darker (treble cut). It not means that they are working it the same way. These circuits will give you many different changes in a guitar tone. You can even combine them together.